Then let us again examine that, Euthyphro, if it is a sound statement [ -- if said truly], or do we let it pass, and if one of us, or someone else, merely says that something is so, do we accept that it is so? Or should we examine [ ] what the speaker means [ -- what the speaker says]? If you wish to justify your beliefs, you give reasons for them. You say that you believe proposition Z because of reason Y. Willingness to give reasons all by itself may be called rationality -- as long as the reasons are relevant. You may also wish, however, to justify proposition(s) Y. So you cite proposition(s) X as the reason for believing proposition(s) Y. Aristotle noticed two things about this procedure. First, we must be able to describe how Y provides a reason for Z and X provides a reason for Y. Logic is just the description of how X implies Y and Z, or that Y and Z are logical consequences of X. Logic can prove Y and Z on the basis of X, but it cannot prove X without further reasons (premises), e.g. propositions U, V, or W. Logic alone can only secure the truth of its conclusions if the premises are true. Thus, it remains an inconvenient but unquestionable truth of logic that one can be perfectly logical and yet, with false premises, never say anything true. If we continue to give reasons for reasons, from Z to Y, to X, to W, to V, to U, this is called the Regress of Reasons. Aristotle's second point, then, was just that the regress of reasons cannot be an infinite regress. If there is no end to our reasons for reasons, then nothing would ever be proven. We would just get tired of giving reasons, with nothing established any more securely than when we started. If there is to be no infinite regress, Aristotle realized, there must be propositions that do not need, for whatever reason, to be proven. Such propositions he called the first principles (archai, principia) of demonstration. Since principium -- from princeps, which is from primus and capio, "to take" -- already means "first" (primus), "first principles" is a redundant expression. This has happened because "principle" has come to mean a rule, perhaps a very basic rule, but not necessarily a first principle in the logical sense. Such a drift of meaning already had occurred in Mediaeval Latin, so that we get principia expanded into principia prima. How we would know first principles to be true, how we can verify or justify them, if they cannot be proven -- the modern terminology is that they must be "non-inferentially" justified -- is the Problem of First Principles. Aristotle decided that first principles are self-evident, which means that we can know intuitively that they are true just by understanding them (by noûs, "mind"). This was widely believed to be the case for many centuries, especially since it seemed to fit perfectly the best example of a deductive system based on first principles: geometry, where all the theorems are ultimately derived from a small set of axioms. In other areas, however, self-evident first principles didn't seem to work very well. Ultimately, Hume and Kant decided that most first principles are not self-evident. Hume thought this meant that we couldn't really even know them to be true, although we had to assume that they were. Kant thought that we could know them to be true, even though they couldn't be proven and were not self-evident. Kant said that such propositions were "synthetic a priori." "Synthetic" means that they can be denied without contradiction, i.e. they do not contradict themselves or anything else that is true. Now that is called "axiomatic independence." "A priori" means that they are known to be true independent of experience. Although there is not much agreement on whether Kant explained this successfully, Leonard Nelson (1882-1927), following a suggestion in Kant, later thought that there were really two questions involved: 1) the actual justification, what Kant called the quid juris, or matter of right, which we can set aside for the moment; and 2) the question of whether the first principles are simply there, i.e. whether we use them -- something never doubted by Hume and called the quid facti, or matter of fact, by Kant. Nelson understood that this could lead to a theory of knowledge much like Plato's. In recent philosophy, virtual nihilists (perhaps "non-cognitivists" is the polite expression) like Richard Rorty solve the Problem of First Principles by saying that we simply get tired of giving reasons. In a way this is true, or, more like it, we simply run out of ideas (rather quickly), but this does not solve any of the logical or epistemological issues of justification. Aristotle had hoped that first principles could be discovered through induction. An inductive inference is the generalization that results from counting individual objects or events. The Problem of Induction is the realization that we can never know how many individuals or events we need to count before we are justified in making the generalization. Francis Bacon believed that empirical science uses induction, and his views influenced everyone's view of science until this century. But Bacon couldn't answer the objection that induction never proves anything. Nor could anybody else, and Hume twisted the knife in the wound. In The Logic of Scientific Discovery Karl Popper shattered the conundra of induction and the verification of first principles by just dismissing them. Induction never had proven anything. Even Aristotle understood that, but it finally wasn't until Hume that the point was really driven home -- although even modern partisans of Hume don't seem to understand the result. Aristotle's problem of verifying first principles was resolved by Popper with the observation that deductive arguments can go in two directions: ponendo ponens, "affirming by affirming," or modus ponens, "the affirming mode": if P implies Q, and P is true, then Q is true. This held out the mirage of verification, since all we have to do to secure things is somehow get P. But a deductive argument can also use tollendo tollens, "denying by denying," or modus tollens, "the denying mode": if P implies Q, and Q is not true, then P is not true. This means that premises can be falsified even if they cannot be verified. If we cannot somehow get P, we might simply be able to ascertain that Q is wrong, especially when P is a general statement and Q its application to some individual. Popper says that this is a form of Kantianism, and in fact it is rather like what Immanuel Kant says in the Critique of Pure Reason at A646-647 under "The Regulative Employment of the Ideas of Pure Reason." Popper also says that it is conformable to the Friesian variety of Kantianism, since Jakob Fries (1773-1843) and Nelson, returning to a consideration of the original problem in Aristotle, stoutly maintained that first principles cannot be logically proven/inferred. This explains many peculiarities in the history of science and is, indeed, the "logic of scientific discovery," although people like Thomas Kuhn have muddied the waters with other issues (some of them legitimate, some not) -- in The Structure of Scientific Revolutions. In relation to Popper's understanding of the logic of scientific discovery, the point of interest is how Socratic Method uses falsification. The form of Socratic discourse is that the interlocutor cites belief X (e.g. Euthyphro, that the pious is what is loved by gods, or Meletus, one of the accusers of Socrates in the Apology, that Socrates is an atheist). Socrates then asks if the interlocutor also happens to believe Y (e.g. Euthyphro, that the gods fight among themselves). With assent, Socrates then leads the interlocutor through to agreement that Y implies not-X (e.g. the pious is both loved and hated by the gods). The interlocutor then must decide whether he prefers X or Y. That doesn't verify or prove anything, but one or the other is falsified: just as in science a falsifying observation may be itself rejected instead of the theory it discredits. Although Y often has more prima facie credibility, the heat of the argument is liable to lead the interlocutor into rejecting Y for the sake of maintaining their argument for X (though, with Euthyphro, Socrates does not agree with either premise). Socrates then, of course, finds belief Z, which also implies not-X. After enough of that, X starts looking pretty bad; and the bystanders and readers, at least, are in no doubt about the outcome of the examination. The logical structure evident in Socratic Method was already being used in the form of Indirect Proof or the reductio ad absurdum argument in mathematics and elsewhere. In this, the contradiction of what is to be proven is assumed. It is then shown that this implies a contradiction with other assumptions or definitions in the matter. Logically, according to the Law of Clavius [(-P > P) > P], this establishes the truth of what is to be proven. Classic examples of Indirect Proof are the arguments discovered by the Greeks that there is no largest prime number and the square root of 2 is an irrational number. Why it was always possible for Socrates to find another belief that would imply not-X is a good question. 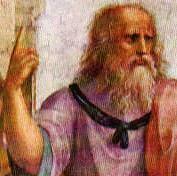 Plato had thought that true first principles [note] were unavoidable. We use them always, even though we usually don't realize it and even when we may even think that we aren't. Whenever Socrates questioned people, he had always been able to maneuver them into contradictions. Plato decided that this happened because Socrates could always find the way to bring out the conflict between everyone's false beliefs and the true principles that they inevitably employed somewhere. With a contradiction, however, which side is true and which is false, or whether maybe both sides are false, is an open question. Thus, Plato conceived of Socratic Method as the way to discover the truth on the principle that a completely consistent system of belief is possible only for the true first principles. Otherwise false beliefs would create contradictions with the unavoidable true principles. As Hume said, whatever our philosophical doubts, we leave the room by the door and not by the window -- the same Hume who ruled out, not just miracles, but also free will and chance because he thought they all violated the same principle of causality that he so famously doubted. Nelson suspected that consequently, while Socratic Method did not really justify the first principles, it did provide a way to discover them. In a practical sense, that may be just as good as justification, and we can even say that Hume did more or less that very thing. It does always give Socrates, and us, a way to pursue the inquiry when we seem to reach an impasse. Socratic Method thus shares the logic of falsification with Popper's philosophy of science and thereby avoids the pitfalls that Aristotle encountered after he formulated the theory of deduction and faced the problem of first principles and of induction. Both Socrates and Popper are left in a certain condition of ignorance because the weeding process of falsification never leaves us with a final and absolute truth: we always may discover some inconsistency (or some observation) that will require us to sort things out again [note]. Our ignorance, however, may be of a peculiar kind. We may actually know something that is true, but the limitation will be in our understanding of it. Galileo was in a position to know that the sun was a star, but his understanding of what a star was still was most rudimentary. Isaac Newton had a theory of gravity that still works just fine for moderate velocities and masses -- the force of gravity still declines as the square of the distance -- but Einstein provided a deeper theory that encompassed and explained more. When it comes to matters of value that scientific method cannot touch, Plato had a theory of Recollection to explain our access to knowledge apart from experience, and his theory was actually true in the sense that we do have access to knowledge apart from experience; but Immanuel Kant ultimately provides a much deeper, more subtle, and less metaphysically speculative theory that does the same thing. Plato's own (reductio) argument against Protagoras's relativism brings out this point. It is that relativism itself uses the very principle of absolute truth that it explicitly rejects. Relativism cannot even make its own claim without holding that it is above the relativity that it postulates. But if relativism is not absolute, then it allows its opposite, namely absolutism. Relativism could be true only if it were relatively relative, and that is not a denial of absolutes. Subjectivism has the same problem. If there is no knowledge (objectivity), how can we know that? If there is no objective truth, that would be an objective truth. So if subjectivism were true, clearly we couldn't know it, we would just have our subjective impression that no one would need to pay any attention to. Be careful whenever a philosopher (like Hegel) begins talking about "reason" -- just as when Mr. Spock used to say in Star Trek, "Logic dictates." Logic doesn't dictate very much, and we must be very careful what someone means by "reason" when they begin invoking it. As you have seen, logic requires premises, and it ultimately cannot prove those premises. If "reason" means logic, it really only means consistency; but in principle, there could be an infinite number of consistent logical systems. Since Hume thinks that all first principles are established by sentiment, he properly asserts that, "Reason is and ought to be the slave of the passions." Other philosophers (Aristotle, Plato, Kant) may mean more by "reason" than consistency, but we must be clear exactly how that differs from logical consistency. What would make the principles revealed by Socratic Method true is a deeper issue that will be considering in the following essay, "The Foundations of Value, Part II, Epistemological Issues: Justification (quid juris) and Non-Intuitive Immediate Knowledge." Plato also used the term archê, like Aristotle, but didn't define it in terms of logic and the regress of reasons. In Plato's day logic didn't exist yet, so it wasn't until Aristotle that the regress of reasons could even be described. Archê in Greek philosophy had originally been used to mean the elements. He grokked that this was one of the critical cusps in the growth of a being wherein contemplation must bring forth right action in order to permit further growth. He acted. At a dinner for [Werner] Heisenberg one night later, [Moe] Berg heard someone say that the war was all but lost for Germany. The physicist sourly responded, "Yes, but it would have been so good if we had won." "Big-League Spy: Movie plays up catcher's role in WWII," by Michael Kaplan, the New York Post, June 17, 2018 -- former major league baseball catcher (1923-1939), Moe Berg, posing as a physics student for the OSS, to find out how close Heisenberg was to building an atomic bomb. Jacob Bronowski (1908-1974) was a multitalented scientist in his own right but became widely known as a philosopher and historian of science, particularly for the innovative television documentary The Ascent of Man (1973), which he completed shortly before his untimely death. The tweflth chapter in the series was titled "Knowledge or Certainty," which gives us warning that, apparently, we cannot have both. The culmination of the point has Bronowski at Auschwitz, where he had lost relatives, standing on swampy ground where he says the ashes of many victims were dumped. At the end of the presentation, he pulls some of the muck up out of the water, the image of which is fixed with a freeze-frame. Bronowski wants to make the argument, in a dramatic, emotional, and even inflamatory manner, that the desire, the quest, or the conviction of certainty in knowledge, or of the existence of "absolute knowledge," leads to moral atrocities like the Nazi extermination camps. This is a particulary heavy accusation to make, since it condemns most of the history of philosophy, when, from Plato to Descartes and beyond, certainty was considered part of the very meaning of knowledge. Since the practice of the Rationalists, especially, seemed to discredit their own claims about certainty, and some version of the Skepticism of Hume has come to be triumphant in modern philosophy, the question does arise about the status of the traditional meaning of knowledge. Bronowski was not unusual in regarding skepticism or uncertainty, not only as an epistemologically satisfying resolution, but as a morally laudable and edifying solution as well. Similarly, Bronowski's dismissal of "absolute knowledge," although perhaps directed specifically at Hegel, leaves the implication that, in the absence of absolutes, Relativism is also morally edifying. Unremarked by Bronowski, however, is the irony and paradox inherent in his presentation; for Bronowski himself exhibits a moral certainty, and an absoluteness of judgment, that must be of at least equal or greater degrees than those of the Nazis, in whose motivations we often suspect some element of cynicism. Thus, while quoting Oliver Cromwell's famous exhortation to consider that one may be wrong, Bronowski does not consider for an instant the possibility that his own moral judgments about Auschwitz and the Nazis might be wrong. No Relativism when it comes to mass murder. This is, to be sure, quite proper; but Bronowski has some explaining to do and obviously is naively unaware and oblivious that he has sinned in terms of his own stark and dramatic, indeed melodramatic, performance. We have no proper account from him of the basis of his own moral judgments, especially keeping in mind the Skepticism of Hume himself, that morality cannot be justified by reason. "Be uncertain" cannot generate a substantive system of ethics; and "reject absolutes" is clearly not what he appeals to in the assertion of his own moral judgments. There is clearly some kind of confusion involved. Indeed, Bronowski is doing little more than expressing a wish that lessons learned from the history of science, pace Hume, will carry over directly into moral edification. Specifically, the Uncertainty Principle of quantum mechanics seems to be presented as a lesson for uncertainty in everything. This does not follow, and, even if it did, it would prove too much. Thus, the originator of the Uncertainty Principle, Werner Heisenberg, remained a servant of the Third Reich -- which Bronowski does not mention -- although the degree of his commitment or guilt remains unclear and controversial [note]. And, if we are to be uncertain about everything, then Bronowski must consider that the Nazis might have been right, and that he, the Jews, and many of the rest of us properly should have perished in the noble purification of the German race. ...one should never permit a disorder to persist in order to avoid a war, for war is not avoided thereby but merely deferred to one's own disadvantage. [The Prince, Bantam Books, 1981, p. 20]. Timely action in 1936 or 1938 called for a level of conviction, certainty, and resolution that a philosophy of general uncertainty is not likely to provide. It is not clear how Bronowski, with his stated principle, could have urged action against the Nazis at a time when so many considered preparations for war to be "war mongering" and an unwarranted threat to the (stated) peaceful intentions of the Germans. Indeed, in the Apology, Socrates himself, while disowning the possession of any wisdom, nevertheless stakes his life, and loses it, by avoiding actions that he does not consider "to be good or just or pious" [35c]. Like Bronowski, Socrates expresses a level of certainty and resolution that raises questions about the coherence of his thought. Thus, even as we must always be sensible of our fallibility, it is difficult but essential to judge when uncertainties must be put aside and forthright action must be initiated. This will depend on the content of our convictions, which themselves should specify when the stakes become high enough, with life and justice on the line, that action is necessary. "You should be uncertain" is not a helpful command or exhortation in those terms; and both Jacob Bronowski and Socrates were clearly untroubled when, for them, a moral threshold had been reached. In fact, they are admirable precisely for that. Yet they appear never to have been cognizant of the paradox of their own virtue. It is too late for us to overlook that now. Bronowski's own argument allows him to go beyond the mere use of a "Be uncertain" principle. His description of quantum uncertainty is that it provides for a certain amount of "tolerance," a term that he borrows, not from physics, but from engineering, with a meaning that is then insensibly transfered to a moral and political application. This does not follow, and it commits the very non sequitur explained by Hume between inferences of fact and value, not to mention that physics cannot really supply the concepts that will be used in moral or political propositions. Even if we let him get away with that, it still leaves the nature of the limits of tolerance without any principle for their determination. Bronowski speaks as though the moral issues are self-evident, and this displays a completely naive and uncritical understanding of ethical matters. Nevertheless, if we allow that there are moral limits to tolerance, and that these limits can be defined in moral and political terms, which will be semantically and axiomatically foreign to things like Schrödinger's Equation, then we can say that Bronowski's theory can match his practice, which is that, at some point, he will draw an absolutist line and say, not with Cromwell, but with Luther, Hier stehe ich, ich kann nicht anders. That is more the tone and flavor that we get seeing Bronowski at Auschwitz. The standard apologetic for Werner Heisenberg is that he pretended to work on an atomic bomb for the Nazis but was neither enthusiastic nor really serious, probably deliberately slow-walking or even sabotaging the project. There now seem to be a number of bits of information that contradict this defense. One is from after the War, when the British had arrested German scientists and were housing them in an English country house -- a house that was thoroughly bugged to record all their conversations. The British had done this with a lot of German officers who had been captured during the War, when their unguarded conversations had betrayed knowledge of German plans, war crimes, etc. The same thing was done with the German scientists. This was all kept secret for many years afterwards. When the atomic bombs were dropped on Japan, and the events announced to the public, the Germans read about it in the newspapers that the British supplied. Heisenberg was surprised. He had not been unenthusiastic about the German atom bomb project, and he had not sabotaged it. He had genuinely come to believe that a bomb could not be built. Hence his surprise. So from this we learn that Heisenberg was serious about his weapons work and was not just playing along. Now we learn that the United States had an OSS (Office of Strategic Services) spy who got close to Heisenberg during the war. This was Moe Berg, who for many years had been a professional baseball player and then coach. But Berg also had a degree from Princeton in "classical and romance languages," to the point where he would practice Sanskrit during baseball games, and while playing he earned a law degree from Columbia. Not your average baseball player. In 1943, Berg was recuited by William "Will Bill" Donovan, the head of the OSS. His first responsibility was the Balkans, and he parachuted into Yugoslavia to check out the resistance groups. He thought that Tito was the better bet, but it is not clear to what extent he may have been deceived by Tito and other sources about the other resistance group, that of Draža Mihailović. There was a systematic disinformation and smear campaign against Mihailović, not just from Tito but with the cooperation of Western lefists and the Soviet agents who had actually infiltrated the OSS, that Mihailović was a fascist who was collaborating with the Germans. This was all lies, and the result was that Mihailović was eventually captured and executed by Tito, resulting in a Communist Yugoslavia. So it would be important to know the details of Berg's reports. Berg was armed and authorized to assassinate Heisenberg, if he thought the man consituted a threat. He actually left the dinner talking to Heisenberg, but he didn't think there was a threat and so let the chance pass. Meanwhile, except for the Battle of the Bulge, the War was won. From these indications, which have only slowly come out since the War, we know that the apologetic for Heisenberg is not correct. What we don't know is the depth of Heisenberg's adherence to Nazi ideology. He may have just been a German who wanted Germany to win a war, after losing the last one. This was not unusual among Germans. If it went further than that with Heisenberg, chances are we will never know -- there do not seem to be attested public statements from him about the Nazis, race, or the Jews. Heisenberg never candidly discussed what he thought during the War, and we don't seem to have any testimony about it from people who knew him. This is not surprising, and we probably have the phenomenon of people thinking that Heisenberg was too historically important to allow him to be discredited. Much the same thing happened with Martin Heidegger, whose misdeeds were whitewashed by people who should have know better, and who has only been slowly exposed (like Heisenberg) with the (literal) passage of decades. We don't know how much Jacob Bronowski knew about Heisenberg before his untimely death. What we know now, however, would seem to explode the idea that the Heisenberg Uncertainty Principle has any chance of working as a moral prinicple. Both Heisenberg and Heidegger -- and of course many others -- are exposed as, at the very least, gravely deficient in moral and political judgment. This provides no grounds for Bronowski's argument about "knowledge and certainty." "I have already explained to you that what is out of the common is usually a guide rather than a hindrance. In solving a problem of this sort, the grand thing is to be able to reason backward. That is a very useful accomplishment, and a very easy one, but people do not practice it much. In the everyday affairs of life it is more useful to reason forward, and so the other comes to be neglected. There are fifty who can reason synthetically for one who can reason analytically." "I confess," said I, "that I do not quite follow you." "I hardly expected that you would. Let me see if I can make it clearer. Most people, if you describe a train of events to them, will tell you what the result would be. They can put those events together in their minds, and argue from them that something will come to pass. There are few people, however, who, if you told them a result, would be able to evolve from their own inner consciousness what the steps were which led up to that result. This power is what I mean when I talking of reasoning backward, or analytically." "...The only point in the case which deserved mention was the curious analytical reasoning from effects to causes, by which I succeeded in unravelling it." While the immortal Sherlock Holmes created a mythic gold standard for reasoning, anyone looking for a sensible explanation of the form of his reasoning will come away with very confused and erroneous ideas. One point made in the statements quoted above, from the two earliest Sherlock Holmes stories, that there is a significant difference between reasoning from causes to effects and from effects to causes, is quite right; but nearly everything else is wrong. Most importantly, reasoning from effects to causes is not a "very easy" accomplishment which somehow merely comes to be "neglected." It is in fact very difficult, and its difficulty underlies one of the foundational problems in Modern Philosophy, the Problem of Knowledge, as this was exposed by René Descartes. Reasoning from causes to effects is not necessarily "more useful" in everyday affairs, but it is definitely easier. The difference in use and ease is the result of an important logical characteristic of causality: causes are sufficient conditions to their effects, while effects are necessary conditions to their causes. This means that sufficient conditions make things happen, while things will not happen without their necessary conditions (conditiones sine qua non). What goes along with this in the world is that usually many different possible causes can produce the same effects. A dead body, after can, can be the result of natural causes, accident, or homicide, and there are many, many possible ways in which any of these things could happen. Given a set of circumstances, however, and a knowledge of the laws of nature, what can happen is usually quite restricted. If I drop something, it will fall. If I turn on the oven and put some food in it, the food will cook. In everyday life, we frequently reason from causes to effects and from effects to causes. This is "forward" and "backward," in Holmes' terms, not in any sense related to logic, but simply in relation to time. Causation moves forwards in time. Given effects, we are going to need to think backwards in time. This owes little to the nature of logic but much to our knowledge of the laws of nature. As children, we do not know that the hot iron will burn us. Once we discover, we will not make that mistake again. But if we discover a burn on our clothes, we may not know immediately where that burn came from. The iron? The stove? The radiator? A match? We must imagine the universe of all possible sources of burns. Then we must, as Holmes himself says, begin eliminating the possibilities. But sometimes this simply cannot be done. There may not be enough evidence. Another circumstance that makes reasoning one way easier than the other is indeed the connection to time. If we do not know the effects that certain causes will produce, we can always set the causes in motion and then see what happens. Given the effects, however, waiting around to see what happens will not help. We would need to run time backwards. This can only be done in the imagination. Given the possible causes we imagine for given effects, it may happen that they all get eliminated by the evidence. Then we must start over and try to imagine new possibilities. In such a case, we may test our new ideas, to see if such causes do produce such effects. We find Holmes doing this himself, most strikingly in "The Problem of Thor Bridge" [Sherlock Holmes: The Complete Novels and Stories, Volume II, Bantam Books, 1986, pp.564-587], where an experiment produces a chip in the stonework of the bridge, demonstrating that the supposed murder could have been a suicide, as the homicidal weapon could have been removed from the scene by the presumed victim, even in death. Holmes' explanation of the problem involved in his reasoning, in dealing with causation, is quite right, but we get a very poor sense of the difficulties that attend the problem and a very deceptive impression that this is more a matter of logic and method than of the nature of our knowledge or of the case. The impression is reinforced by his use of the terms "analytical" and "synthetic," as though these are forms of reasoning. Actually, there is no real meaning of "analytic" or "synthetic" that is relevant to his point. "Analytic" means "take apart," and "synthetic" means "put together." "Analytic" usually concerns taking apart, unpacking, or distinguishing the parts of meaning, initially of words but then possibly of larger constructions, like theories. The contrast between analytic and synthetic was originally made by Kant, for whom analytic truth depends on the meaning of a sentence, while synthetic truth depends on some circumstance over and above the meaning of a sentence. None of this is related to Holmes' usage. Since Holmes uses "analytical" to mean reasoning from effects to causes, the implication is that causes can be discerned simply by taking apart the effects. This is generally impossible, since the effects say nothing about the laws of nature, and often very little about the circumstances, that produced them. A bit more like "analysis" would be reasoning from causes to effects, where, if one possesses knowledge of the relevant laws of nature, the values of the case can be inserted, and a prediction made about the result from an application of logic (and/or mathematics) alone. What Holmes (or Sir Arthur) may have had in mind were Mediaeval ideas that effects somehow actually contain their causes. This would be nice. It reflects a moment of wishful thinking in the history of philosophy. Were it the case, then one would be able to recover the causes of events by a simple analysis of the effects. This could explain why Holmes thinks that this sort of reasoning, "backward, or analytically," is "very easy," when it is actually nothing of the sort. As is often the case in science and philosophy, talking about how you reason very often turns out to be very different from the way you do reason. In the Sherlock Holmes stories, we thus often find Holmes struggling to imagine what causes could possibly have produced particular effects. In all cases, it is the imagination working, in conjunction with Holmes' general knowledge, that produces the answer, not a simple analysis of the crime scene. The explanation of the nature of his reasoning is of interest for what is right in it and what is wrong, and for comparison with the other general issues of knowledge and reasoning considered above. 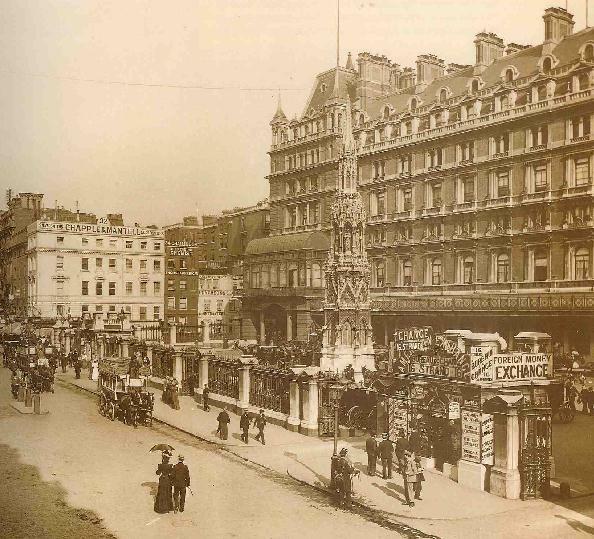 Above we see Charing Cross Station in London in 1895. The "Cross" is the spire monument placed nearby by King Edward I to commemorate where the body of his wife, Eleanor of Castile (descendant of Alice of Vexin), rested on route to burial at Westminster Abbey in 1290. The monument in front of the railroad station is a reproduction and is not at the original site. 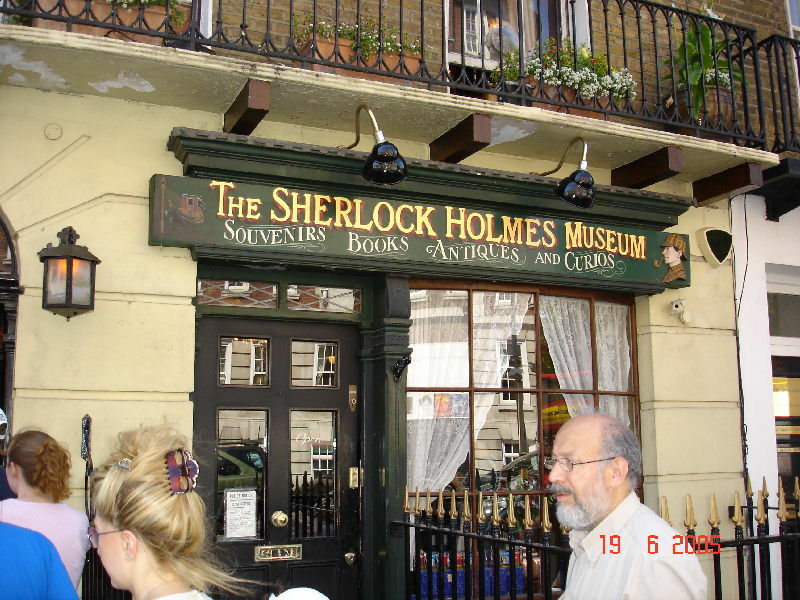 Holmes and Watson often left on their adventures from the Station, which is still in use. 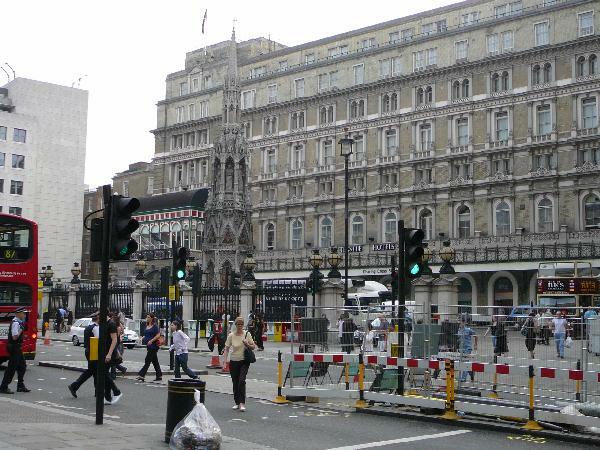 It is also regarded as the geographical center of London. The "American Exchange," to lower right, is mentioned in A Study in Scarlet. Below is the station in 2006. The American Exchange is gone, but the building looks substantially the same (now a "Thistle Hotel"), except for the roof: evidently the fireplaces have been removed and so the roof and upper story have been rebuilt. The tiles with the silhouettes of Holmes shown on this page, as at right, are those used in the Baker Street subway station in London. The iconic Meerschaum pipe and the deerstalker hat, by which these images are recognized, are actually not attested in the Holmes stories. They were developed early by actors in stage plays based on the Holmes stories. In the canon, Holmes typically smoked a cheap clay pipe, which might be bought for as little as a farthing. Since smoking is now politically incorrect, the pipe is sometimes eliminated altogether from Holmes memorabilia, such as refrigerator magnets. I find this outrageous, and I felt some vindictive Schadenfreude when a tourist store on Baker Street that had been selling the pipe-less magnets went out of business. In the previous essay, "Justification, First Principles, and Socratic Method," the Problem of First Principles was in the end addressed through Socratic Method in terms of the Kantian quid facti, i.e. that we can seek to discover what the First Principles are. However, the deeper question of the Kantian quid juris, what really makes the First Principles true, or what justifies them, was temporarily set aside. At this point, the answer to that issue can be found in one of the most pivotal doctrines of the Friesian tradition: the theory of non-intuitive immediate knowledge. This is a profoundly paradoxical doctrine, which is at variance with contemporary notions of immediate knowledge and intuition. Non-intuitive immediate knowledge is the category to which Fries and Nelson assign the knowledge that belongs to the object language systems [note] of metaphysics and ethics, as opposed to the empirical category to which they see the metalanguage, i.e. epistemology itself, belonging [note]. Here "intuition" is used for the German Anschauung as used by Kant (who says intuitio in Latin) and the Friesians, and it does not mean "intuition" either in the ordinary sense of a spontaneous belief or in the similar philosophic sense. In Kant the notion of intuition originally seems to be the equivalent of perception and perceptual knowledge [Critique of Pure Reason, Norman Kemp Smith translation, St. Martin's Press, 1965, p. 65]. The conception becomes confused, however, when Kant himself appears to conclude that perception cannot be knowledge, or even perception, without the mental activity of synthesis [ibid., pp. 129-150, the famous "Transcendental Deduction" in the first edition of the Critique of Pure Reason]. The conclusion would reduce "intuition" to no more than a pre-conscious receptivity of the senses. Intuition as "immediate" knowledge would also thus become impossible, since knowledge would require the mediation of the intellect to become knowledge. Friesian theory accepts Kant's earlier notion of intuition as being immediate knowledge, albeit not conceptually articulated in any way. Nelson's point in that regard [Nelson, op. cit., p. 120] is that not all knowledge can be mediate, or conceptual, because all conceptual propositions, except tautologies and contradictions, are essentially arbitrary and must, for their truth or falsity to be determined, be referred to some external ground. The "external ground" then for perceptual knowledge is immediate knowledge in perceptual intuition, which as such cannot be any kind of belief or thought. In this respect the Friesian theory of truth [Nelson, p. 117] is a combination of traditional correspondence and coherence theories: coherence in that the conceptual expression and the immediate knowledge both belong to consciousness, and must merely be made to conform to one another; and correspondence because immediate knowledge is a representation of the external world and so, on the principle that our representation contains the objects of our knowledge (phenomenal objects), the external world itself, requiring that the purely mental entity, the belief or the propositional representation, corresponding to the world, must be mediately constructed. By the principles of the dual nature of representation (that representation is both internal, a mental content, and external, the phenomenal object of our representation) and of ontological undecidability (that we cannot decide whether representation is "really" internal or external) we may consider the Friesian doctrine of truth to be the equivalent of the strongest traditional correspondence theory, that there is an isomorphism between truth in internal representation and states of affairs in the external world. The difference between intuition and immediate knowledge is that the concept of intuition contains the added feature of immediate awareness -- that the intuitive ground is explicitly present to consciousness. The intuition that we have is perception, and the objects of perception are empirical objects. Since we are ordinarily strongly inclined to believe that knowledge implies awareness of knowledge, it is a very powerful tendency to equate our intuition with our immediate knowledge as such. That gives rise to what Nelson calls [Nelson, "Prejudice of Logical Dogmatism," p.141 and diagram p.146] a "dogmatic disjunction" in the attempt to formulate the nature of the ground of metaphysical knowledge: that any knowledge is either from intuition or from reflection. This is to say that any case of knowledge is either mediate, involving concepts and thought, where through reflection new knowledge can be generated, or immediate, where all immediate knowledge is intuitive. At right is a version of Nelson's chart from "The Critical Method and the Relation of Psychology to Philosophy" [Nelson, p.146]. This is one example of Nelson's axiomatic diagrams. Given the "dogmatic disjunction" as the starting point, Nelson sets out a simple axiomatic system to demonstrate the various epistemological approaches to metaphysics [pp. 141-153]. If one accepts (1) the disjunction and also accepts (2) that metaphysical knowledge is possible and that (3) our intuition is empirical, then the only possible conclusion is that the source of metaphysical knowledge is in reflection. For Nelson that is the nature of the traditional system of "dogmatic" or speculative metaphysics. Those systems may be relatively naive, relying on Euclidean sorts of proofs and "self-evident" premises whose self-evidence remains an unexamined claim, or they may be relatively sophisticated with peculiar doctrines of logic (as with Hegel) to account for the manner in which thought generates new knowledge. Dogmatic metaphysics is untenable, however, once it is realized that reflection cannot generate knowledge that is not already implicit in its data. Logical derivations and analytic truths are no more than rearrangements of what is given. The speculative generation of scientific hypotheses escapes the failing of dogmatic metaphysics because scientific method looks to the empirical verification or falsification of the hypotheses. That way is not open, by definition, to metaphysics. With a new premise that reflection is essentially empty of any new ground or source of knowledge, we cannot accept all of the original three premises of dogmatic metaphysics. Rejecting premise (2) that metaphysical knowledge is possible results in the conclusion of empiricism that all synthetic knowledge is ultimately grounded in empirical intuition. Rejecting premise (3) that all our intuition is empirical results in the conclusion of mysticism that metaphysical knowledge is possible because we possess, or can possess, a special intuitive ground for it. The final alternative, which Nelson calls "Criticism," is to reject premise (1), the "dogmatic disjunction," and conclude that there is a third source of knowledge besides intuition and reflection. Since a division into mediate and immediate is logically exhaustive and we already accept that mediate knowledge, or reflection is empty, then there must be immediate knowledge which is not intuitive. This must actually mean that we are unconscious of the non-intuitive immediate ground. The knowledge itself is neither believed nor thought, as such, and it is not explicitly present to us as the table or chair is perceptually. The "Critical" conclusion tells us nothing positive or definite about what non-intuitive immediate knowledge must be. Even to be legitimately forced to a conclusion that some immediate knowledge is not intuitive obviously does not tell us what it is, and so I characterize this as a merely "negative" theory which must remain inadequate for that reason -- as we are left to wonder what kind of knowledge we could possibly possess without being aware of it. The conception is by no means new, however, for it corresponds to one of the most characteristic and important doctrines of Plato: namely that what we think we know is only opinion and what we really know we actually don't know that we know. Plato's explanation for that condition was also characteristic, and paradoxical, not fitting precisely into either the dogmatic or the mystical categories of Nelson's analysis; for Plato held that our metaphysical knowledge is a momentarily forgotten memory of a prenatal intuition. This is ultimately an appeal to intuition, but in present time it is only an appeal to memory. In his own way Plato thus approximates, with a positive doctrine, the conditions of non-intuitive immediate knowledge: that it is known but not at first known consciously. With this analysis in hand, Friesian theory can describe all the possible ways that a proposition can be grounded or justified [Nelson, pp. 111-121]. There are three of these, what Karl Popper called Fries's Trilemma [Karl R. Popper, The Logic of Scientific Discovery, Hutchinson of London, 1959, 1977, pp.94,104]: (1) Proof, which is justification by logical derivation. Tautologies, analytic propositions, can be proven, given the rules of logic, by themselves; all other proofs require premises, which outside of logic are ultimately going to be synthetic. (2) Demonstration, which is justification by the display of an intuitive ground. In daily life this is the most conspicuous means (apart from arguments from authority), not just of the justification of belief, but of the origin of ordinary knowledge. And (3) Deduction (in Kant's legalistic sense [Kant, op. cit., p.120]), which is justification by means of a description of the non-intuitive ground of the belief or proposition. "Deduction" is the peculiar Kantian vehicle for dealing with non-intuitive immediate knowledge, and it is the theoretical heart of Friesian introspective empirical epistemology. "Proof," "demonstration," and "deduction" are terms that all traditionally mean proof; but Demonstration and Deduction in these new Friesian senses are in no way logical derivations in the object language. Demonstration is merely a showing of the obvious. Where the obvious is no longer present or escapes the nature of our perceptions, then other considerations come into play. Deduction is a showing of the unobvious, but still importantly a showing. Deduction cannot logically prove the propositions in questions any more than the demonstration of an intuitive ground can. But the cognitive force of each is the same. Popper himself errs in his evaluation of the trilemma by mischaracterizing the choices and supposing that the cognitive force of each justification is a matter of subjective confidence and certainty. This is what Popper means by the description of Fries's system as "psychologism" [p.94]. Its cognitive certainty is only psychological and subjective, and the result of causation -- which, as Descartes discovered to his distress, is not a cognitive relation. Popper's sense of the term is different from other uses of "psychologism" for Kant and Fries, against which Nelson wrote his doctoral dissertation. That doctrine is characterized by the principle that the structures of the world are really only structures of the mind, the psyche, which are projected onto the world. Popper only sees the certainty as projected. The first questions about non-intuitive immediate knowledge would be how it comes to be consciously known, having been unconsciously known, and then how we know that it is what we think it is. In Kant's classic terms, as we have seen, those are the questions of the quid facti and the quid juris [Kant, p.123]. The quid facti, the conscious possession of the non-intuitive knowledge, is obtained by reflection, specifically by taking our ordinary naive acts of judgment as objects and then by abstracting from them the forms or presuppositions they had unconsciously employed [Nelson, "The Regressive Method: Induction and Abstraction," pp. 105-110]. Since the presence and focus of consciousness is in its object, the forms or rules by which the object is known, or generated, are themselves not perceived; but taking consciousness itself as an object can bring those presupposed forms into the objective focus, making possible their entry as such into consciousness. Nelson's theory in this respect is not satisfactory. He thinks that the abstract forms are recognized by a method of "regressive abstraction," but this is really just an appeal to intuitionism and is really no more satisfactory than saying that they are self-evident, once we think about them enough. But since Nelson did think that this occurs through Socratic Method, it is possible to ignore the intuitionistic aspects of his theory and just see Socratic Method, as described above, using the logic of falsification. The method, then, as in science, is to imaginatively construct rules to explain the phenomena and then test their logical consequences against those phenomena -- where the phenomena, of course, are our statements, not our empirical intuitions of the world. One of the nicest examples, from outside philosophy, of the quid facti is the recognition of grammatical rules of language. Language as an elaboration of consciousness by which objects are conceptually articulated contains many forms that are not intuitively known; and there is no more conspicuous a contrast than in a child between the fearful complexity of rules that are so easily manipulated with respect to their objects yet so securely hidden in themselves. Another sort of conspicuous contrast is when a language teacher insists on the correctness of palpable grammatical archaisms yet usually entirely fails to employ them in ordinary speech. Obtaining the quid facti is simple in principle, but in practice reflection is never as easy as it seems it should be. Nelson's conception of Deduction seems to be that it is sufficient to show that the ground of the object language propositions must be non-intuitive [Nelson, "Theory of Deduction," pp. 122-125]. That would seem to be only half the answer, however, having said what the ground is not while leaving the question unanswered what the ground is, providing no general theory of the ontology of the non-intuitive ground of various object languages. A consequence of that is that the various object languages, once identified as such, remain isolated from each other, each a solitary universe of thought maintained solely by Nelson's "self-confidence of reason" [p.126]. The ontological ground of the difference, for the Friesians, seems to be lost in the unknown qualities of things in themselves. The continuation of the theory, therefore, will be in ontology rather than in logic or epistemology. Such questions are treated in the following essay, "The Foundations of Value, Part III, Metaphysical Issues: The Theory of the Good." "Object languages" are deductive systems (i.e. theorems derived from axioms) which are described by a "metalanguage," i.e. propositions that do not belong to the deductive system but which refer to it. Leonard Nelson, Socratic Method and Critical Philosophy, Dover Publications, 1965, "The Verification of Judgments: Proof, Demonstration, and Deduction," p. 153. It is the most distinctive claim of Friesian epistemology that the propositions constituting the "critique of knowledge," i.e. epistemology itself, are empirical and a posteriori rather than non-empirical and a priori, as are the propositions of ethics and metaphysics. In modern Epistemology, we hear about something superficially similar to the Friesian Trilemma. This was evidently proposed by German philosopher Hans Albert (b.1921) and is called the "Münchhausen Trilemma" or "Agrippa's Trilemma." The "Agrippa" in this case is Agrippa the Skeptic, who lived in the first century AD and who adduced five arguments against certainty: (1) Dissent -- there are disagreements even between authorities and experts; (1) Infinite Regress -- proof can be demanded for the premises of any proof; (3) Relation -- i.e. Protagorean Relativism, that the character of things is relative; (4) Assumption -- that premises of proofs are suppositions; and (5) Circularity -- that arguments may beg the question, i.e. assume what is to be proven. I cannot tell from such arguments against certainty whether Agrippa was a Pyrrhonian or an Academic Skeptic. The idea of circularity seems to underlie the characterization of Albert's trilemma as the "Münchhausen Trilemma," since Baron Münchhausen is supposed to have pulled himself and his horse out of a swamp by pulling up on his own hair. Albert's trilemma is simpler than Agrippa's, but it also has a Skeptical motivation. It is stated in terms of three forms of logical justification: (1) Circularity; (2) Infinite Regress; and (3) Regress to Axioms. Circularity, of course, is an out and out logical fallacy, the formal fallacy, of "Begging the Question" or Petitio Principii. If you can assume what is to be proven, you can literally prove anything. With ease. This cannot be taken seriously as an epistemological principle, and of course it is unrelated to the Friesian Trilemma, in which all the branches are themselves forms of genuine justification. Infinite Regress is not a fallacy but a problem. The regress cannot be completed, which means that the justification cannot be accomplished. One's reasons will usually be exhausted pretty quickly, and some philosophers may be satisfied with that; but there is no pretending that this really proves anything. Indeed, the exhaustion of reasons contradicts the principle of an infinite regress, since the procedure of the regress, to question every new set of premises, is abrogated. The regress, let alone the infinite regress, is abandoned. But if Circularity and Infinite Regress are forms of justification meant to undermine certainty and establish Skepticism, we may well see them as adqeuate for that purpose. Finally, Regress to Axioms simply returns us to Aristotle's original treatment of the Regress of Reasons. Albert's own Skepticism appears to rest on questions about the certainty or justification of axioms. While Albert is correct to question Aristotle's solution of self-evidence as the justification of First Principles, he seems to question, not that such propositions actually are self-evident, but that they would still be inadequate even if they were, since they would violate the Principle of Sufficient Reason. This is hard to credit. The "reason" behind self-evident First Principles is, indeed, their self-evidence. On his argument, Albert would need to question the axioms of logic, which are true because of their own form. And perhaps he does. But this would be a profoundly nihilistic Skepticism indeed. Instead, we may question self-evidence because of the inherent difficulty of knowing that something, which may not be true because of its form, is indeed self-evident. Agrippa's principle of "Dissent" will do the job. Material self-evidence relies on a subjective certainty, just as in Popper's confused accusations against Kant and Fries. This is undermined by the disagreement of authorities and experts. How does one adjudicate their disagreements? That is the downfall of Aristotle's solution to the Problem of First Principles. Since Albert's other examples of justifications for axioms, of common sense or authority, are logical fallacies again, informal fallacies (the Argumentum ad Populum and Argumentum ab Auctoritate, respectively), they are straw men. There are two solutions to the Regress to Axioms. Popper's solution is that the axioms are tested in science by falsification, which means that we do not need to verify or justify the axioms in any other way. We simply expect that false axioms will eventually result in false predictions and so, as a practical matter, they will be taken care of. The other solution, of course, is the Kant-Friesian doctrine presented here, of Proof, Demonstration, and Deduction. The Friesian Trilemma may be compared with a similar classification in John Locke. Locke distinguished "three degrees of Knowledge, viz. Intuitive, Demonstrative, and Sensitive" [An Essay Concerning Human Understanding, Book IV, Chapter II, �14, "Sensitive Knowledge of particular Existence"]. In this system, "intuitive" knowledge is self-evident, by which, in Locke's own example, we know of our own existence, with a Cartesian certainty. "Demonstrative" knowledge is that which can be established by logical proof, by which Locke believed that the existence of God could be established. Finally, "sensitive" knowledge is that by which through perception we are acquainted with "the particular existence of finite Beings." This consitutes Locke's answer to Descartes, in the sense that, considering our relation to external objects, "some Men think there may be a question made." Locke allows that the certainty of our perceptual knowledge of the world is not as great as with intuitive or demonstrative certainty, but it is nevertheless substantial and sufficient for both practical and philosophical purposes. Locke is unable to sustain a distinction between intuitive and demonstrative certainty, for he has neglected to notice that proofs are only as sound as their premises, which reduces the level of demonstrative certainty to that of the premises of the proofs. This leaves only the alternatives of intuitive or sensitive certainty for them. It then does not help that his example of demonstrative certainty, namely his own proof for the existence of God, suffers from a trivial logical fallacy (as examined on the page for Locke). Locke provides us with no criterion for intuitive certainty, but there is no impediment to anticipating the logical criterion of Hume and Kant that such truths ("relations of ideas" and "analytic" propositions) cannot be denied without contradiction. This is itself demonstrable through indirect or reductio ad absurdum proofs, where the denial of what is to be proven implies what is to be proven (with classic examples, known since the Greeks, such as the proof that the square root of two is not a rational number). We now might see about how Locke's categories match up with alternatives in the Friesian Trilemma. This works imperfectly, because they are really not quite about the same things. "Intuitive" and "demonstrative" certainty might be associated with Friesian "Proof," which encompasses logical justification. In the Friesian category of Proof, however, we are not embarrassed that logical proofs are only as certain as their premises, since the Friesian Trilemma is not about degrees of certainty but about procedures of justification. A proposition may be justified by its deductive premises, whatever the status of those premises. When we then seek justification for the premises, Proof will also cover those premises that are logically or analytically true, as can be ascertained through indirect proof. If the premises of our proofs are not analytic, then they are synthetic, and can be denied without contradiction. Locke's "sensitive" level of certainty will then apply to the Friesian procedure of justification in "Demonstration," by which an intuitive ground is indicated in perception. We may now say that a Cartesian level of certainty in this case is compromised by the fallibility of our perceptions. However, this does not discredit the procedure of justification or its customary degree of certainty; for as our perceptions are fallible, they are also corrigible, and by the same procedure. Thus, if we come to doubt the nature of our judgment about some empirical object, perhaps in being contradicted by some other observer, we might consult other observers, or we might directly reexamine the object, if this is possible. A considerable amount of progress in science is achieved by the simple expedient of reexamining the phenomena, as when Philoponus and Galileo tested Aristotle's assertions about falling bodies. That Philoponus could not be certain that bodies of different weights were not falling at the same rate meant that more careful exmaination of the phenomenon was in order, while the lack of an observable difference required some reflection on the laws of nature that must be behind such a result. This is also part of the trivial procedures of daily life, as when we come to suspect that there is some foreign object in the soup. An appeal to the cook may be in order, but the truth of the matter cannot be established by authority alone (especially as we must take into account the bias of the cook to affirm the unadulterated character of his product). For the Friesian category of "Deduction," Locke has no corresponding level of certainty. His failure to apply logical criteria to his characterizations of "intuitive" and "demonstrative" certainty precludes an understanding of the problem of synthetic a priori propositions, even as the failure of many modern philosophers to attend to Hume's own logical criteria precludes their understanding of Kant's response to Hume. The Friesian theory of non-intuitive immediate knowledge is thus even further removed from informed consideration. G.E. Moore is famous for claiming (in Principia Ethica) that the good cannot be defined. Robert Pirsig, in Zen and the Art of Motorcycle Maintenance, says something similar but then later has to admit that he says quite a bit about what the good ("Quality") is. Nevertheless, what he says about the good is less a definition than a description of its reality: he thinks that Quality is a deeper level of reality (like the Tao) than the world as we see it. That approach to the good, however, goes all the way back to Plato. In the Republic Plato distinguishes two levels of reality, the World of Becoming (transient and imperfect), which we see, and the World of Being (eternal and unchanging), which we don't see. Although Plato deliberately avoids giving a definition, he says that the good is to the world of Being what the sun is to the visible world -- the source of all knowledge and even existence. Several centuries after Plato, the Neoplatonists said that the good is simply Being itself (or beyond Being) and the source of all existence. The Neoplatonists used Plato's metaphor of the sun, claiming that all existence radiates from the good the way light radiates from the sun -- and that evil is the outer darkness of non-existence. In modern philosophy, Immanuel Kant did not speculate about the relation of value to being, but he did distinguish two levels of reality as Plato did: the world as it exists in our perception ("appearances" or phenomena), and the world as it exists apart from our perception or in itself (things-in-themselves or noumena). Kant thought that all our knowledge was about phenomena, except for moral knowledge, which was based on things-in-themselves. Kant didn't think we could know how that worked, but, rather like Hume, he took it as a given. This all certainly makes it sound like the word "good" is hard to define, but that is actually wrong if what we mean by good is the common sense of an instrumental good. An instrumental good is something that is good for something, as a light bulb is good for providing light. In that sense, "good" can be exhaustively defined: the instrumentally good is that which is sufficient to its purpose. Saying that a light bulb is good for providing light is the same as to say that the purpose of a light bulb is to provide light and, perhaps, it accomplishes that purpose to a greater extent than other things, like candles, that provide light. Many ordinary definitions of "good" suffer from the difficulty of a circular definition by merely replacing "good" with a equivalent value term, like "value" itself, or "beneficent," which comes from the Latin word for "good," or "moral order," all of which simply throw us back to the larger question about the nature of value, which is what our question about the good was really about in the first place. The idea of purpose adds a completely different dimension to the question about the good. Note that there are two possible instrumental judgments about light bulbs: a light bulb may be a good light bulb, i.e. it does what a light bulb is supposed to do, and a light bulb is a good light source, i.e. it does what any light source is supposed to do. A good hammer does what a hammer is supposed to do, drive nails. Even driving nails "well" can be given a purposive definition: the nails are expected to go in straight, quickly, and leave the nailhead flat on, or just in, the wood. A good car does what a car is intended to do -- get you where you want to go reliably and with some degree of comfort. If these things are not adequate to their purpose, we say that there is something "wrong" with them. If what is wrong can be set right, then they can continue being good examples of their kind. If what is wrong cannot be set right, then they become bad examples of their kind, a bad hammer or a bad car. Instrumental goods do not create the greatest difficulties with defining the good. There are other goods that are good in themselves. They are not good for anything. These are the ultimate goals or ends of mere instrumental goods, which otherwise would generate a infinite regress of ends. They are intrinsic, rather than instrumental, goods; and intrinsic goods are what seem to resist definition. Intrinsic goods still maintain an obvious relation to purposes, since, as Aristotle puts it, "the good is that at which all things aim." The question, however, which Aristotle did not ask, is why things aim at these ends. The good is not good because things aim at it. Instead, things aim at the good because it is good. So why is an intrinsic good, good? That is the kind of question to which Moore decided there was no answer, and to which Plato etc. could only provide a metaphorical answer. All in all, this is rather odd. How can an instrumental good be so easily defined but an intrinsic good not at all? However, everyone may have gone looking far and wide for the answer that was at hand all along. If an instrumental good is what serves its purpose, an intrinsic good may do the same. The only difference is going to be that an intrinsic good will be its own purpose. Just as an instrumental good is the means to an end, where the end is distinct, an intrinsic good is a means to an end where it is an end in itself. Aristotle even had a word for this: "entelechy," meaning "actuality," "fulfillment," or "having the end within." Since instrumental goods always serve some end, intrinsic goods prevent that process from continuing forever. This definition is adequate formally, but it is not adequate intuitively: it is still hard to say what this is supposed to mean or why it would be a good definition (instrumentally) of the good. What is intuitive about this view is that it maintains the connection between the good and purpose. A deeper understanding of intrinsic goods thus must come with further reflection on the nature of purposes. A purpose is normally something in the future. If the purpose of the hammer is to drive nails, we usually pick up the hammer with the intention that we are going to drive nails with it. Once the nails are driven, the hammer is returned to irrelevant storage. The hammer becomes irrelevant because the driven nails stand independent of the hammer. An end in itself, however, would not be separate from its purpose. There is no futurity, just presence. We do not pick up the end in itself with the intention of achieving its purpose in the future. We pick up the end in itself because the purpose is already achieved therein, just as we watch a movie in great measure for the end in itself of being entertained. Nevertheless, there must be some sense that the purpose of the thing, like the value of the thing, is distinct from the factual instrumentality of the thing. Otherwise fact and value would simply be identical, which they are not. The uniqueness of an intrinsic good is that fact and value are equated, but they are still not the same thing. Otherwise we would not need to identify a thing as intrinsically good of its kind. But how can one and the same thing contain a factual presence and something that corresponds to the futurity of an instrumental good? That is where the two levels of reality, after the fashion of Plato and Kant, come in. Hume's distinction between fact and value puts value at a grave disadvantage. Facts seem to be based on experience and on the world, while value doesn't seem to be based on anything of the sort -- indeed, Hume's distinction is usually used to dismiss any foundational existence of value. What is is there for all to see, but what ought to be doesn't need to exist at all. Since Hume himself was a subjectivist, the obvious thing to say might be that value is based on nothing but our own feelings and so doesn't exist separate from us. Hume's subjectivism, however, is a theory of how value is known, not what value is. Hume didn't think that we could say what the basis of value was any more than he thought we could say what the basis of matters of fact was. Hume's scepticism did not mean he doubted that matters of value were there any less than matters of fact were there. He just didn't think we could understand how. Identifying the good with being, like Plato, the Neoplatonists, or Pirsig, certainly reverses the disadvantage that value has vis à vis fact, but it doesn't explain how things which ought to be but don't exist have some relation to existence. Distinguishing two levels of reality, like Plato or Kant, can divorce fact from value, but it just seems to introduce two different kinds of existence, which sounds like an ad hoc, arbitrary sort of solution. Updating Kant a bit, however, can take care of this. The kind of existence that we experience is not the same as the existence of some external object like a rock. What exists in the rock cannot be destroyed. In modern physics this is called the Conservation of Mass (or Mass-Energy). In Greek philosophy, Parmenides claimed that existence could not be destroyed because non-existence or Nothing was "altogether unthinkable." The Indian classic, the Bhagavad Gita, agreed with this, that "the unreal never is; and Real never is not." But our existence, as we know well, is vulnerable to non-existence. That is called "death." Death, however, does not mean the non-existence of our bodies. It doesn't even necessarily mean the death of our bodies. It means the end of consciousness, since the kind of existence that we experience is the existence of consciousness. Consciousness, in turn, is a very peculiar sort of thing. In modern philosophy, Edmund Husserl (following Franz Brentano) has said some of the most interesting things about consciousness: and one thing he says is that consciousness is always consciousness of something. Consciousness always has an object: it is always a relationship between subject and object. This is called the "intentionality" of consciousness. In Indian philosophy, the Brhadaranyaka Upanisad says something similar, that knowledge always involves a Knower and a Known -- but the Knower is not Known as Knower. If the subject becomes an object, to be known, then it is not the subject anymore; but the subject is still there, knowing the object. The contents of consciousness exist by virtue of the existence of the subject. The subject, however, is not known as such by the contents of consciousness. The contents are spontaneously projected onto intended objects. Objects are known by means of the contents of consciousness. This divorces consciousness from the real existence either of subject or object: What exists in the subject is projected onto objects, divorcing us from the subject (the Knower). But we only know objects by those subjective contents, leaving us still divorced from the existence of external objects as such. René Descartes got tangled up in this relationship and decided that we couldn't be sure that external objects even existed. The whole world could be a hallucination (the possibility of solipsism -- I alone exist). Descartes felt sure that he existed (his consciousness does exist) and so thought that the mind is better known than the body. But consciousness divorces us from the existence of the subject just as much as it divorces us from the existence of the body (an external object). Hume and Kant both saw that any uncertainty we have about external existence (the body) must be balanced by uncertainty about internal existence (the mind). The strangeness of consciousness enables us to combine Plato, Kant, etc. into a theory of the good. We can say that existence is value, being is the good, but that this identity and symmetry is broken by consciousness, which is the kind of existence that we possess. The asymmetry that results is the difference between subject and object on one side and between is and ought on the other. Consciousness divorces its contents from existence as such, either as subject or as object. That makes consciousness precarious: it makes death, the non-existence of consciousness, possible for us. The existence that we enjoy is a kind of reflection of existence proper. The reflection gives us matters of fact; but our real, direct perception of unreflected being is through matters of value: Value is the shadow that being casts into phenomena. The role of death suggests a parallel with another ancient conception of the good: Zoroastrianism, the ancient religion of Iran, founded by the prophet Zarathushtra -- Zoroaster in Greek -- Zarda t, Zardo t, Zardoha t, Zarâdo t, and other pronunciations in Arabic or Modern Persian. (Nietzsche wrote it "Zarathustra" in German; writing it "Zarathushtra" with an English pronunciation is quite close to the original.) Zoroastrianism basically identified life with the good and death with evil. Things like violence and pain are then evil through their relationship with death: pain is the body's way of telling us that damage and death threaten it; and violence either threatens to create pain or to effect death itself. If that is a good identification, then consciousness creates the realm of good and evil, as it does the realm of life and death. In the Symposium Plato says that the only form of value we can see is beauty, and he thought that appreciating beauty would lead us on to insight into the World of Being. Indeed, we can see beauty. At the same time we are aware that beauty is not the same thing as the factual or scientific attributes of an object. Thus we say that "beauty is in the eye of the beholder." But it isn't. Beauty is in the object, and it is in beauty that we see through the factual reflection of reality into Being itself. Indeed, beauty is relativistic and cannot be reduced to a conceptual system (de gustibus non est disputandum -- "there is no disputing taste"), but other kinds of value, like morality, can be better, even absolutely, conceptualized. They actually are all kinds of beauty. Morally good things may even be more beautiful than the beauties of nature or art, even if it is more difficult to perceive them as such. As Kant says: "Two things fill the mind with ever new and increasing admiration and awe, the oftener and more steadily we reflect on them: the starry heavens above me and the moral law within me." Contemplating the beauty of nature may raise the question, as it did for Kant, whether the world has any purpose. Is the world, or life, for anything? This is the same as to ask whether any natural objects, apart from our purposes, are instrumental goods. However, trying to conceive of natural objects as instrumental goods leads into the Antinomies of purpose, suffering, etc. Teleological explanations are properly excluded from science, which deals with natural objects only as the products of causation. We must remember, however, that the rejection of teleological explanations merely means the rejection of natural objects as instrumental goods. Purpose is still part of the world when we regard natural objects as intrinsic goods. Indeed, all natural goods are intrinsic goods. There are no natural instrumental goods. Thus, no good thing apart from human purposes can be for anything except itself. Whatever science says about the "starry heavens above me," they still can bespeak the very things that Plato or Kant thought that they did.